Published Jun 5, 2015 by Sams. Part of the LiveLessons series. These easy video tutorials show how to unleash the full power of WordPress.org’s open source code and customize WordPress to your precise requirements. 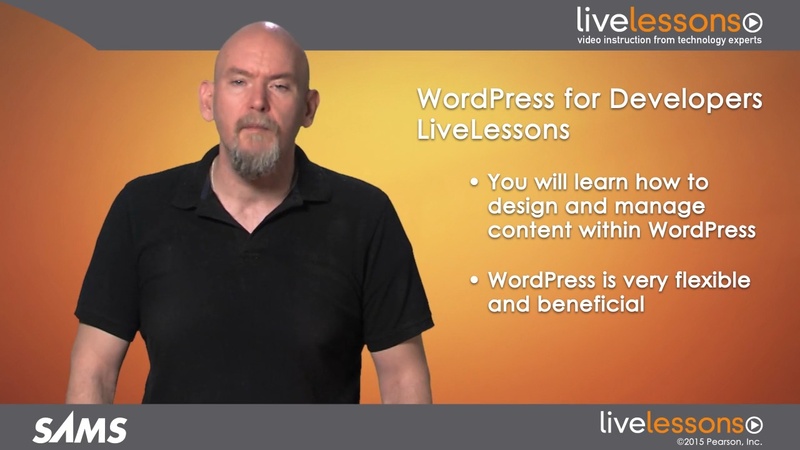 WordPress for Developers LiveLessons walks you through mastering all the development skills you need to make visual, structural, and functional changes that are impossible with packaged solutions. Top WordPress expert John LeMasney walks you through setting up your WordPress development environment, including a complete LAMP stack (Linux, Apache, MySQL, PHP); working with WordPress databases and configuration files; safeguarding WordPress from hackers and spammers; controlling the WordPress engine through functions, hooks, classes, and methods; defining the structure, appearance, and behavior of new themes; using plugins to add powerful new functionality without changing the WordPress engine; and finding the resources and mastering the terminology you need to become an advanced WordPress developer. In just seven hours, you’ll learn how to bend WordPress to your will–and build sites like nobody else’s!